With all of the earthquakes, hurricanes, floods, and everything else going on right now it is more important than ever to do our part to send healing energy to the places and people who need it. Doing inner spiritual work is the best thing you can do for our planet and sending out love and high vibrational healing energy is a close second. According to the Universal Law of Mentalism our thoughts and energy are as real as anything physical and the power of thinking positive thoughts and sending healing energy to those in need is just as real as anything you can give, touch or feel. "This Principle embodies the truth that ‘All is Mind.’ It explains that The All (which is the Substantial Reality underlying all the outward manifestations and appearances which we know under the terms of ‘The Material Universe’; the ‘Phenomena of Life’, ‘Matter’, ‘Energy’, and, in short, all that is apparent to our material senses) is spirit which in itself is unknowable and undefinable, but which may be considered and thought of as an universal, infinite, living mind." 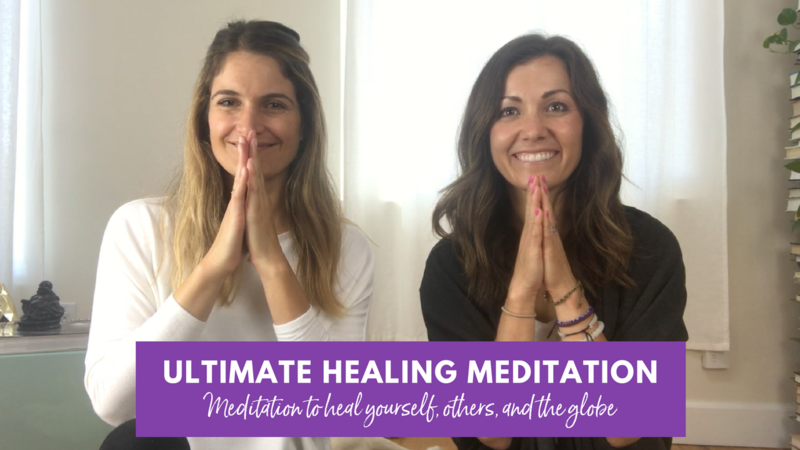 So to be a part of the healing that our planet needs, we thought it was perfect to teach you guys the Kundalini Meditation for Ultimate Healing. We did a FB Live last week sharing this and wanted you all to have it on YouTube so you can start to practice it on the regular. You can view the video tutorial on YouTube here. Ra Ma Da Sa, Sa Say So Hung is the mantra for the sacred healing meditation first taught in the Summer of 1973. This healing meditation is used to pray for healing energy for our friends, family, and ourselves. It was also practiced at every White Tantric Yoga® Course for the Mahan Tantric, Yogi Bhajan. Kundalini Yoga practitioners have been using this meditation for the last four and a half decades. Try it when you want to send healing energy to a loved one or need healing yourself. Practicing the mudra and the mantra properly will optimize the energy flow and will make this meditation all the more potent. This mantra taps into the energies of the sun, moon, earth, and the Infinite Spirit to bring deep healing. It is important to pull the navel point powerfully on the first Sa and on Hung. Note that the word Hung is not long and drawn out. Rather, it is clipped off forcefully as you pull in the navel. Chant one complete cycle of the entire mantra with each breath. Then deeply inhale and repeat. Remember to move the mouth precisely with each sound. Try to feel the resonance in the mouth and in the sinus area. Mental Focus: You can choose to mentally visualize the person or persons that you are wanting to heal, as you send this energy to them for their well­-being. Time: Continue chanting for 11 to 31 minutes. To End: To end the meditation, inhale deeply and hold the breath, as you offer a healing prayer. Visualize the person you wish to heal as being totally healthy, radiant, and strong. See the person completely engulfed in a healing white light and completely healed. Then exhale and inhale deeply again, hold the breath, and offer the same prayer again. Exhale. To complete, inhale deeply, stretch your arms up high, and vigorously shake out your hands and fingers for several seconds. Keep the arms up and hands shaking as you exhale. Repeat two more times and relax. There are certain mantras and meditations that can bring more energy of abundance and prosperity into our lives and I am..
Harness the power of Summer Solstice! Summer is officially on it’s way! It begins with the summer solstice in the northern hemisphere occurring on Tuesd..